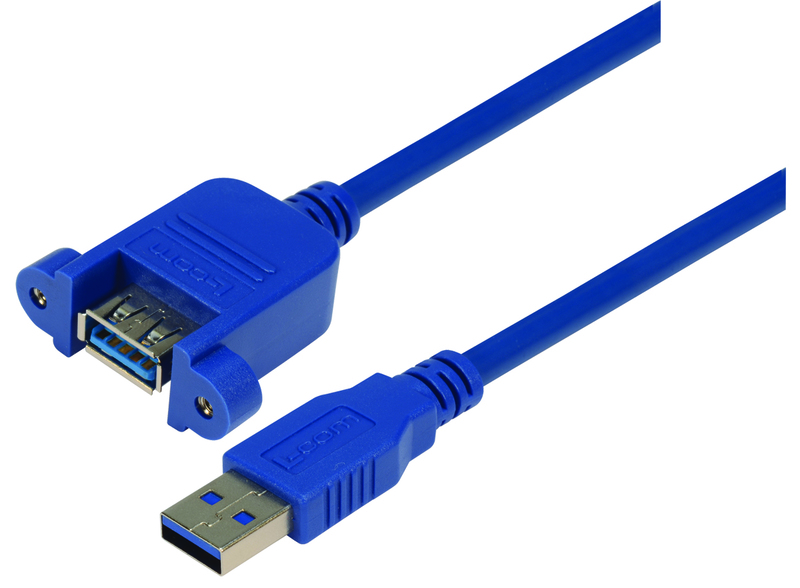 L-com, Inc., a designer and manufacturer of wired and wireless connectivity products, has released a series of USB 3.0 "UPM" style female bulkhead cables in multiple lengths. The new cable assemblies feature side-flanges for mounting the USB 3.0 Type A female, which is helpful where a small footprint is desired. The other ends of the cables are terminated with a USB Type A male connector. NORTH ANDOVER, MA - 03/19/12 - L-com, Inc., a designer and manufacturer of wired and wireless connectivity products, has released a series of USB 3.0 "UPM" style female bulkhead cables in multiple lengths. The new cable assemblies feature side-flanges for mounting the USB 3.0 Type A female, which is helpful where a small footprint is desired. The other ends of the cables are terminated with a USB Type A male connector. L-com has long carried USB 2.0 "UPM" style cables and it recently announced USB 3.0 "ECF" style bulkhead cables in January. These latest products combine these features, offering the side-flange mounting option for the latest generation of USB connectivity. "We fully support and provide solutions for the USB 3.0 standard," said Steve Smith, Product Manager. "We know that's what our customers want and we will continue to innovate for this exciting new technology." Consumer products using the USB 3.0 standard began to appear around January, 2010. L-com has been selling cables to support the standard since as early as May, 2010, and has announced many new USB 3.0 cables and adapters since then. The new products are expected to be stocked in the USA starting in late April for same-day shipments.